“Forget about the T-Rex concept, the six-wheel 500-horsepower V-10 Dodge Ram show truck that Chrysler built last century. There’s a new T-Rex coming to town.” So begins the review of the BREMACH USA T-REX truck line as offered by G.R. Whale and Mike Levine of PickUpTrucks.com, and based on Mr. Whale’s hands-on tests drives and assessments of the truck and EV tech as made and offered here out of SoCal. Their narratives capture much well as to this vehicle product (some of the commentary is quite expert and clearly informed and eloquent). And while while largely accurate (aside from a few understandable details) and expansive, even more detailed overviews of the BREMACH USA T-REX are forthcoming (also especially showcasing the advanced EV technology devloped in these past years by BREMACH USA). In any case, see below some of the impressions made on expert truck and off-road folks. Thank you. Forget about the T-Rex concept, the six-wheel 500-horsepower V-10 Dodge Ram show truck that Chrysler built last century. There’s a new T-Rex coming to town. 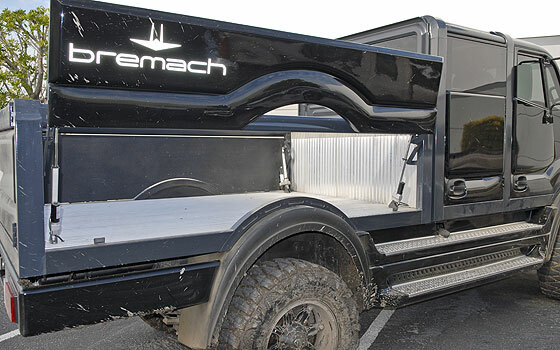 It’s the moniker Italian company Bremach applies to its four-wheel-drive truck, and its distributor, Bremach USA, plans to sell it with a variety of powertrains, including gasoline, diesel, compressed natural gas, gasoline-electric hybrid, and full battery electric. Bremach builds less than 1,000 T-Rex trucks annually, guaranteeing a degree of exclusivity matched only by bespoke truck builders, such as Icon. Bremach was formed from several companies that originally built aircraft and light-freight vehicles — really light, like the three- and four-wheeled milk carts pressed into service by Inspector Clouseau. 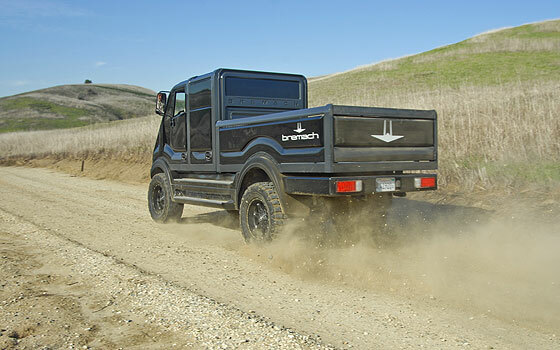 Bremach USA qualifies as a California original equipment vehicle manufacturer, which requires different sales paperwork from the Detroit Three, but it still has to work with the California Air Resources Board. As a result, T-Rex pickups that burn gasoline and diesel use a “remanufactured” engine rather than a new crate motor. The gas engine is GM’s 6.0-liter Vortec V-8 that’s similar to that found in GM’s full-size vans. It’s paired with a GM 4L80-E four-speed automatic transmission. With 323 hp (at 4,600 rpm) and 373 pounds-feet of torque (at 4,400 rpm), it’s one of the lower-revving large-displacement gas engines. The CNG version uses a ULEV-spec L96 6.0-liter found in heavy-duty vans, pickups and light chassis cabs from Workhorse, Freightliner and Isuzu. 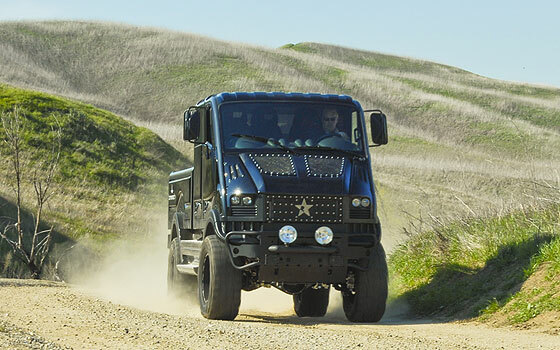 The diesel T-Rex uses a remanufactured Cummins 5.9-liter six-cylinder 24-valve diesel engine, with output rated at 235 to 325 hp and torque rated at 460 to 610 pounds-feet (@1,600 rpm), depending on the truck’s specification. The hybrid T-Rex under development will function like the range-extended Chevy Volt instead of the two-mode Chevy Tahoe Hybrid. It’s a series hybrid pairing a GM four-cylinder Ecotec engine and a 100-kilowatt-hour generator with a 40-kwh lithium-ion battery pack (made up of 32 cells, each roughly the size of a carton of cigarettes). The electric motor that does motor/generator/regen chores is shared with the battery-electric version. 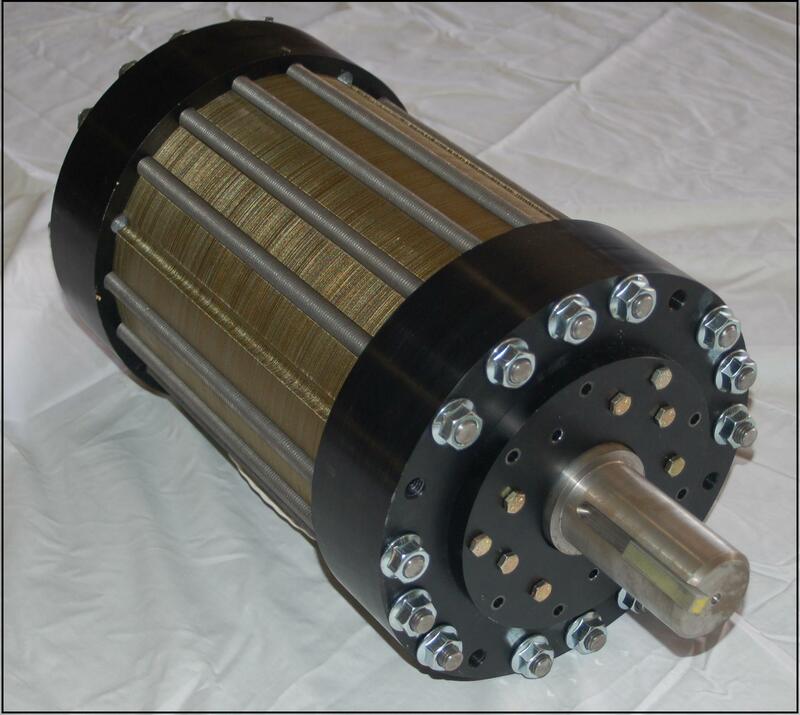 Less than 10 inches in diameter, the motor is rated at 200 kwh peak and 100 kwh continuous output. Torque is rated at least 265 pounds-feet from zero rpm beyond 4,000 rpm. (Generator ratings are 150 kwh peak and 100 kwh continuous.) The hybrid is said to be able to travel 30 to 60 miles on battery power alone before the Ecotec kicks in to recharge the power pack. The full battery-electric (BEV) T-Rex, similar to the Nissan Leaf, uses a larger lithium-ion battery pack combined with the 200-kwh instant-torque electric motor. 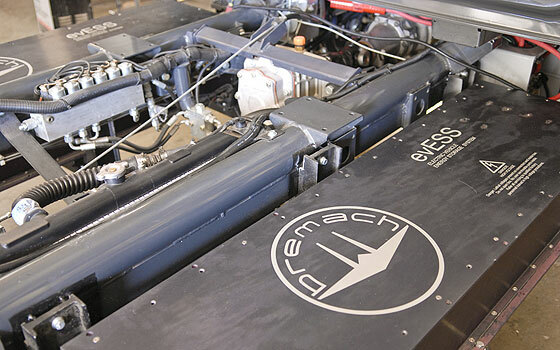 Bremach USA has taken a different approach with the electric motor, which runs at 114 volts DC, substantially less than you might find in other electric vehicles. Bremach claims an all-electric range of 75 to 150 miles. Our 25-minute drive in a prototype involved some lead-footing. We started with a charge state of about 95 percent and finished at about 75 percent, but our test truck didn’t have the high-capacity 100-kwh battery pack that production trucks will use. Such low voltage would typically require high amperage loads, with cabling the size of radiator hoses. To avoid this, Bremach uses a unique motor application (already proven in forklift and airport tug applications) that essentially splits the motor and inverter/controller into three sections, each using 600-amp loads. The closest analogy in a gas engine is a three-rotor Wankel engine where three small combustion chambers deliver the power of a single large one. Bremach says this arrangement is 3 percent to 5 percent less efficient than a high-voltage system but claims the difference can be addressed by one extra battery cell. This route was chosen because it’s a safer setup and because the hardware offers substantial cost savings. Since many of these units will see municipal service, the lower purchase cost and in-house serviceability are important selling points, as are the built-in Ethernet based diagnostics. The electric truck uses the same four-speed automatic with torque converter as the fossil-fuel T-Rex. It shifts just like a properly calibrated automatic does. Since a divorce-mount transfer case is used, any gearbox that physically fits could be used. The Euro market truck is offered with a ZF six-speed manual gearbox or an Allison five-speed automatic. Those trucks come with Fiat four-cylinder diesels with 2.3- and 3-liter capacity. There’s a slim chance future Ram pickups may use those, opening the CARB door for T-Rex to use something similar. Although it has regenerative braking, the prototype electric T-Rex we drove was not programmed to take full advantage of the feature. Recharging is done with a 10-kwh, 220-volt AC unit mounted between the rear frame rails. The battery packs are mounted like saddle tanks. Apart from the engine, electrics and transmission, the major components are all made in Italy. The transfer case, and differential covers are all aluminum alloy. You may recall the Northern Italians — Ferrari, Maserati, etc. — have some experience with sand-casting. Transfer cases are vertical, so the engine sits nearly level, and the front and rear driveshafts and differentials are all centered. 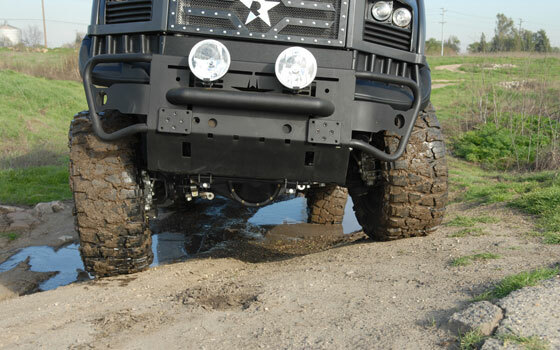 Clear an obstacle with the front axle, and the rear follows clean. The full-time four-wheel-drive case offers low-range ratios of 3:1 or 3.9:1, and our six-ton testers had 5.11:1 axles. So even with the transmission’s steep 2.48:1-1st gear, the crawl ratio is a respectable 49.4:1. That’s better than any typical automatic, including a Jeep Wrangler Rubicon or a new HD pickup with a six-speed automatic. The transfer box torque split runs a 33/67 to 50/50 front-to-rear power bias. Both the center and rear differentials can be locked by electrically controlled hydraulics. On petroleum engines, hydraulic pressure is supplied by the power steering pump; on hybrid/BEV trucks, it comes from an electric pump that also supplies the steering. Braking is supplied by big Brembo discs and Bosch defeatable ABS. The tubes are about 4 inches in diameter, straight from front to rear, and three sides of a box section are welded along the bottom; many of the cross-members are welded in place as well. The rear bumper is bolted on with hitch pins used to adjust the angle of departure; the front bumpers wrap around at the corners to improve approachability while protecting the steering box. By feel, sound or sight, we couldn’t detect any frame flex at all. Leaf springs are used at both ends, the mounts welded to the frame, and they have substantial shackles. The load leaf on the 49-inch-long pack in the 6-ton model is almost three-fourths of an inch thick. Standard tube shocks are mounted very near vertical, inboard of the frame rail in back, with welded tabs ready for a second set. Both ends have antiroll bars, larger at the rear, hung in easily removed brackets. Axles are welded square-tube to the spring pads, round for the outboard stub, and the alloy front cover has a substantial skid plate. Driveshafts and U-joints are conventional, and the front is serviceable with an open knuckle end that bolts onto the axle housing. Only the six-bolt wheel pattern is unusual and may limit your choices in the aftermarket. Bodywork is the appropriate term because an exoskeleton is used for the cab. The frame around it is the primary structure — not as ungainly as the external roll cage on a Land Rover Defender 110, but equally effective. Most of the outer panels are pressed steel, the floor reinforcements are high-tensile steel, and the front quarter panels, running boards and outer bed sides are composites. By pickup standards, ground clearance is decent while approach, departure and breakover angles are all excellent. Driving in two-and-a-half feet of water is not an issue, and outward visibility is superb. Styling, if you want to use the term, is industrial function trumping form, though one of the design teams also worked on the EB110/112 Bugatti sports car, and you can see it in the hood vents. The T-Rex comes in two-door and four-door cabs. The exoskeleton design also allows an open-top two-door in some markets, making that T-Rex look like a giant side-by-side. The single cab seats two (airbag rules work against a three-seater), and the double cab handles five. All the seats are individual, adjustable buckets on air suspension. The front console is more or less lifted from a Ford F-150 — you’ll recognize the old baseball-bat-style shifter, and they needed the cupholders — and the front seats can move inboard a bit on future models to add outside elbow room. The gasoline double cab we sampled had a Bremach USA bed on it, with a floor measuring about 9 feet by 5 feet. The sides lift up for loading, and the tailgate is a swing arrangement that is being redesigned as a conventional tailgate. 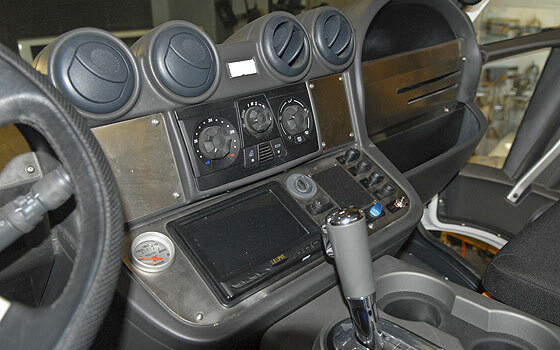 Displays and equipment on the dash vary by powertrain but supply the necessary info. The prototypes we drove still have the kph speedometer, and the BEV has a touch-screen. Four face-level vents in the center handle air conditioning through simple controls. The stereo head unit above the windshield and the switchgear icons are clearly understood. Flat frame rails equal a flat floor, disconcerting only to the front passenger used to angled footwells to rest or brace your feet. The T-Rex with the longest wheelbase is 136 inches, an inch shorter than the shortest Super Duty, and the shorter version is 122 inches. Since the two-door BEV and four-door gasoline truck sampled were six-ton models with a payload of more than three tons, the empty ride quality was stiff and close to bouncy, like a big kart. The air-suspension seats help a lot, and only the pitching motion from the unloaded rear gets tiresome. It wouldn’t be hard to change the spring or shock rates; the 3.5-ton model will obviously ride better, but there wasn’t one available at drive time. The loudest thing on our test ride was the 37-inch mud tires on the gasoline truck. It doesn’t have a big muffler, but the exhaust makes a pleasant burble that disappears as soon as the big meats start rotating. “Engine” noise on the gasoline truck was like a pickup, in the background until you open it up. The electric version simply whined and whirred until road noise drowned it out. Wind noise was relatively low, but we never drove faster than 75 mph. We didn’t instrument acceleration or braking with either of them — that’s so far beyond the T-Rex’s mission, there’s no point. Both the BEV and gasoline version could run with traffic, the latter going faster than we’d typically trust big mud tires to be happy with. Stopping power appeared more than adequate, as the antilock brakes were fairly well-calibrated for loose surfaces; you can switch it off for conditions where a locked wheel will stop you faster. Despite its heavy springs and antiroll bars, the T-Rex does have axle articulation and walks through obstacles well. Speed works to your advantage on washboard or gravel, skipping half the impacts and letting the suspension work on the half you actually do hit. Except for its height, a T-Rex might well make a Power Wagon or Raptor look like amateurs slogging through obnoxious conditions. Side mirrors offer a great view rearward. Unlike most pickups, the mirrors are six feet off the ground and will pass above any car or crossover, and the crotch-rocket rider splitting lanes won’t crack his helmet on them. The view all around is excellent, and you sit level with UPS and coach drivers. 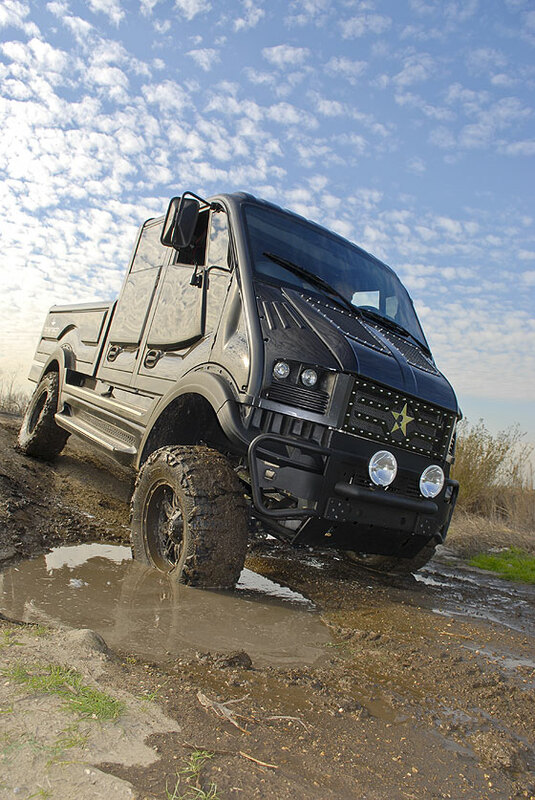 If the T-Rex reminds you of a cross between an H1 and a Unimog, so will the price. 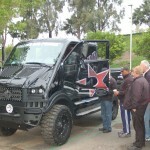 The gasoline regular cab six-ton starts at $96,000. Add another $5,000 for a Cummins diesel or $14,000 for the CNG version or $24,000 for the full battery electric. (Prices don’t reflect any potential incentives for alternative-fuel vehicles.) A bed or service body, running boards, and other bits will add more. That’s expensive, but handmade stuff isn’t cheap. The Icon FJ-45 starts at about $125,000, and if you’re bent on making the FJ-45 pilot feel envious, this might be a good way to do it. Excuse me Mr. Tundra, am I blocking your light?